I took time off on Friday to get the car fixed. It was the number one thing on the list after receipt of my tax return money. The repairs, while not excessive, were to take all day so I decided, since I had vacation time to use up, leaving the car and staying home was a good thing. 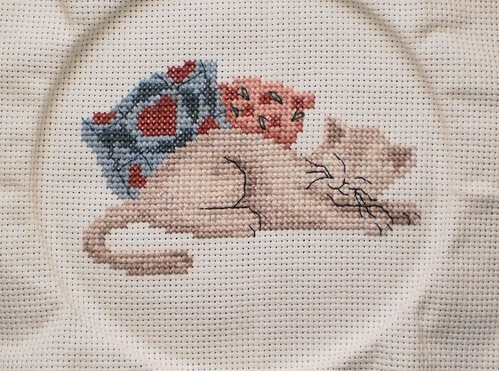 This encouraged blocks of time to do things, like stitching. On Friday, I finished everything in the first circle area, including all the outlining and the lazy daisy stitches on the one pillow. 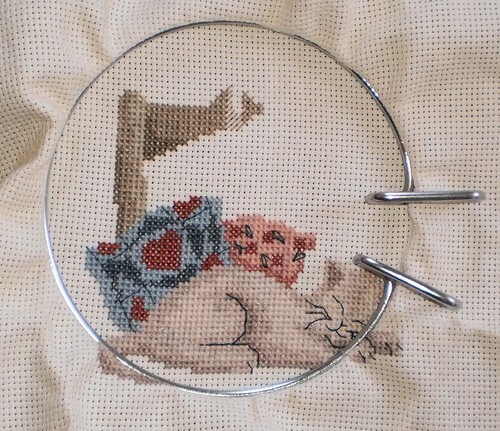 On Saturday, I started working on the final area, a section above the cat. It was going just fine until I ran out of color #612. I didn't have much to start with, going into this project, but I figured I had enough to finish it. Nope. 14 stitches left and there wasn't enough to finish. This meant a trip to the store. Fortunately, there was a huge sale and the floss was marked down. I also took the time, before going, to look ahead at what I want to get done this year and assess my fabric needs. I bought a couple pieces for projects I intend to get to this year. Of course, one never knows. On Thursday, I dropped off the swan piece to be framed and purchased the items needed to finish the Christmas banner. I'm liking the idea of finishing something in between starting something new. So, once this piece is done, I'll be finishing the banner. Then, I can look ahead to a new item. I'm feeling very energized by this crafting phase and am looking at those things I've started but never finished and all the ideas I've had for things to make. So the bathtub doesn't get cleaned this month. So the dishes pile up in the sink. I am loving just sitting in the recliner with jazz softly playing in the background and my cats asleep in the living room as I stitch.